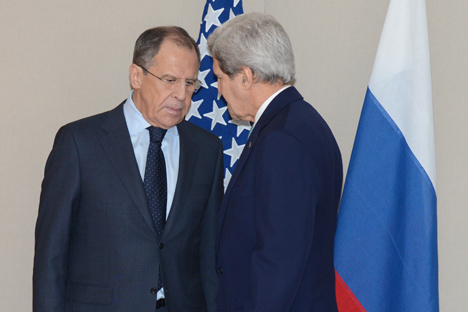 RBTH presents a selection of views from leading Russian media on international events, featuring a summary of the Geneva meeting between Russian Foreign Minister Sergei Lavrov and U.S. Secretary of State John Kerry, as well as a report on gas negotiations between Russia, Ukraine and the EU in Brussels. The Expert weekly business magazine sums up the results of the March 2 meeting between Russian Foreign Minister Sergei Lavrov and U.S. Secretary of State John Kerry in Geneva. The magazine notes that, shortly before the meeting, Kerry spoke before Congress, where he commented in harsh terms on Russia's position about the Ukrainian issue. Lavrov used the meeting to attempt to convince Kerry to use his influence over Kiev concerning the implementation of the Feb. 12 Minsk accord on a comprehensive peace settlement in the Donbass region of eastern Ukraine. This request is as relevant as ever; according to the magazine, Ukrainian President Petro Poroshenko is attempting to frustrate the implementation of the Minsk Agreements. Expert explains that neither the rebels nor Moscow have given him a reason for this; the unrecognized Donetsk and Lugansk “people's republics” (DPR and LPR) have unilaterally carried out the agreement and have begun withdrawing their heavy weapons, as evidenced by the OSCE. According to the publication, the problem is that the actions of Poroshenko, coupled with an escalating political crisis in Ukraine, may cause the situation to deteriorate to the extent that direct involvement by American and European troops may result. Therefore, it is possible that the United States will try to influence Poroshenko, writes Expert. The centrist daily Nezavisimaya Gazeta reports on the talks between Russia, Ukraine and the European Union on the ongoing gas dispute between Moscow and Kiev. It was expected that the main item on the agenda would be the winter gas package – an interim agreement that expires on March 31. However, just ahead of the meeting, it was announced that the parties would discuss the summer package as well – that is, the conditions of supplies after the said period. Apparently it was a surprise for the Russian side, writes the newspaper. Nezavisimaya Gazeta reminds its readers that on Feb. 22 the Russian holding company supplied less gas than the Ukrainian state energy company Naftogaz had ordered, which the representatives of Gazprom explained by the lack of advance payment from Ukraine for March. Naftogaz paid another $15 million as an advance. However, according to the head of the Russian Ministry of Energy, Alexander Novak, even in the case of extremely economical use, Ukraine will run out of the gas that it paid for by March 7. The head of the Russian National Energy Security Foundation's analytical directorate, Alexander Pasechnik, said in comments to the newspaper that Ukraine could theoretically refuse Russian supplies in March – but it would break all the previous agreements and exclude any talk about the summer package or any concessions from Gazprom in the future. The negotiators also discussed the issue of gas supplies to the DNR and LNR, Nezavisimaya Gazeta writes. The European Commission believes that the supply of gas to the breakaway republics should be discussed separately from the issue of supplies to Ukraine. The newspaper notes that Gazprom is ready to deal with the Donbass separately from its main contract with Naftogaz. The condition for this should be a written refusal by the Ukrainian company of gas supplies to the DNR and LNR, but it would mean, in fact, the refusal of the state-owned company to fulfill its obligations to the citizens of Ukraine and would thus put into question the territorial integrity of the country, the newspaper concludes.